Explore the shores of one of New York City's five boroughs on this private miles of beaches tour of Staten Island. Check out various beaches including South Beach, Miller Field, Cedar Grove and Great Kills Beach at Gateway National Recreation Area. It's the perfect way to get a taste of the city's coastal landscapes and scenic shores without having to travel far beyond the Manhattan skyline. 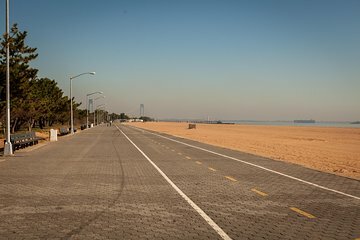 Staten Island's East Shore has miles of boardwalk that still attract swimmers, sunbathers and runners. This popular private tour makes stops at some of the area's top attractions and showcases urban beaches that are a stone's throw from the Manhattan skyline. Your tour makes stops at SITRAC, an incredible venue for track and field, plus Cedar Grove, Great Kills Park at Gateway National Recreation Area and more. During summer months be sure to pack a suit, towel and blanket so you're ready to splash and sunbathe. Transportation around Staten Island is included in the tour and travelers can opt for a city transit bus ride back to Manhattan after spending time at the beach.